The setting was beautiful, the weather cooperative and the variety of talent was there. The audience, however wasn't. There were maybe 300 people present all day. Sure the previous day was windy and the day before that, some folks had to work yet, I was expecting 1,000 or more people to be in attendance. The festival was heavily promoted in all the local media. I received press releases early on that were informative and well done. The prior promotion was excellent. I really don't know what happened here. There should have been more people there considering the 1-Million population of the region and more as you expande a mere 50 miles. What happened? Well, for one thing, there was another well established event (not a music festival) the same weekend in the same area. So, they were definitely competing for audience -- especially since the other event was free and the festival was $40 per day or $80 for three days. That put this festival at a grave financial disadvantage, especially considering the economy today. 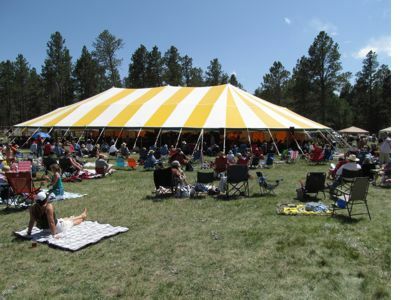 I attended both events and the free event was a big crowded mass of people while the music festival was roomy, friendly, cooler, and in a natural setting. There were a variety of band styles from bluegrass & folk to country and blues and a few in between. All of the acts were entertaining however, I didn't recognize but a few names on the program. I was introduced to some fine entertainment at the event -- local and national -- that I had never heard before. That is always a positive experience however, a festival needs names to draw people in. I realize they can't afford the top national acts, Grammy or IBMA award winners or such but, there are plenty of national acts with draw and recognizable names. I spoke to many of the vendors and it was going to cost some of them more to be there than they were taking in. A financial loss for many. Again, not a healthy sign. Prices for good were in line with all the other regional festivals so it wasn't that and the food was good too. Inside the festival tent, I experience several fun bands but, I couldn't understand anything they were singing. The sound was awful. Beautiful sound board, well distributed speakers but, it wasn't engineered well. There is more to sound engineering than hooking up the pieces. There are great sound engineers in the area -- get one! Please! We received great high quality programs at checkin and they were informative, entertaining, well laid out and of high quality. The schedule was clear day by day. You knew when your favorite band was supposed to hit the stage. Well, kind of. They were way off on the schedule. In fact their 4:30 raffle didn't happen by the time we left after 8 PM. Acts were generally running 30 - 45 minutes behind schedule. How they could be so far off when the day's events didn't even begin until 11 was amazing. So, the setting, performers, program, promotion, was all first rate. The date, sound, draw and management were not. These are fixable factors and I certainly hope the festival takes them into account. It can definitely turn into a winning event for the area. Tighten up the schedule, get a sound engineer that understands tent sound and the variety of instruments and vocals, and pick a few name bands and see what happens. If they can't change the date, at least make it Saturday, Sunday and Monday of the Memorial Day weekend -- Not Friday, Saturday and Sunday when many have to work on Friday. They put a lot of energy, effort and expense into putting this festival together and they certainly deserve credit for that. They had a huge staff and plenty of volunteers also. Parking was close, vendors were great, prices reasonable and if they can get more people to attend, they can also start to offer a better talent lineup. This one was actually pretty good even if they were not top name acts. Lots of good surprises!